1-lb each of our most popular 8 colors! 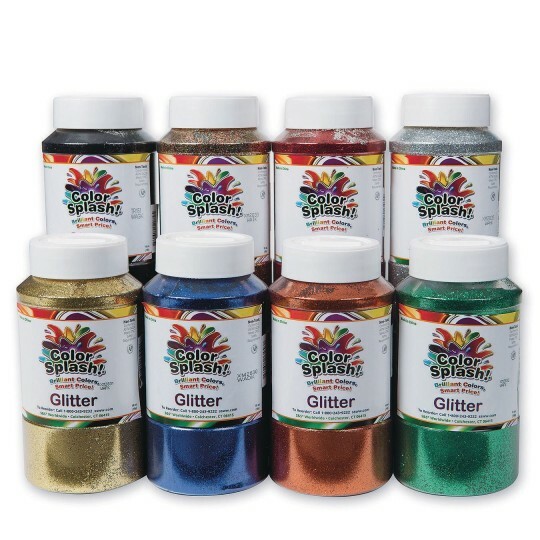 For a longer-lasting sparkle, try our non-tarnishing glitter to brighten craft projects, create beautiful masks, personalize greeting cards, liven up posters, and decorate packages. Sprinkle over glue to give ornaments, paper, or fabric creations a touch of brilliance. Convenient plastic shaker-top containers reduce spillage. 8-pound Value Pack includes 1-lb each of our most popular 8 colors: blue, gold, green, multi, red, silver, copper, and black. Non-toxic. It's glitter and gets everywhere. We love the variety and easy opening bottles. Easy poor. Everything needs a little glitter. The glitter is very fine and sticks well to projects. We used this to decorate pillar candles as Christmas presents and the children were able to make beautifully colored candles to give away. Be sure to keep the clear plastic covers that are under the lids. Replace them after each use to help them store without spilling. can be used on many surfaces I speak from experience. large amount of glitter that can be used for many projects and throughout a long period of time. Easy storage to remove glitter and to place glitter back into one container.